The Photonics Europe exhibition and conference in Brussels from April 12 – 16th, 2010 will include an Innovation Village. 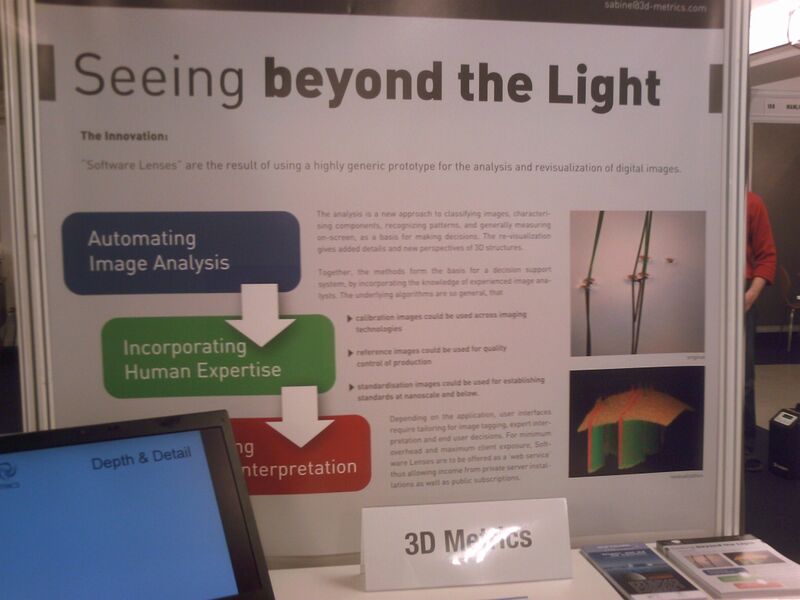 “Software Lenses” are the result of using a highly generic prototype for the analysis and revisualization of digital images. 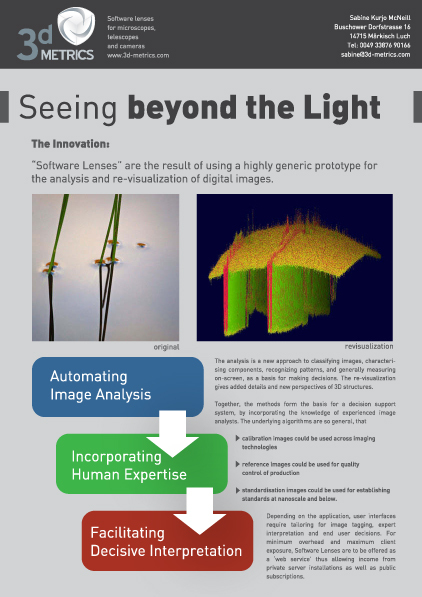 The analysis is a new approach to classifying images, characterising image components, recognizing patterns, and generally measuring on-screen, as a basis for making decisions. The re-visualization gives added details and new perspectives of 3D structures. Together, the methods form the basis for a decision support system, by incorporating the knowledge of experienced image analysts. standardisation images could be used for establishing standards at nanoscale and below. Depending on the application, user interfaces require tailoring for image tagging, expert interpretation and end user decisions. For minimum overhead and maximum client exposure, Software Lenses are to be offered as a ‘web service’, thus allowing income from private server installations as well as public subscriptions. The original input image shows bulrushes in water and their reflections. The re-visualization output shows the water as a curved surface with the grass blades above and below. 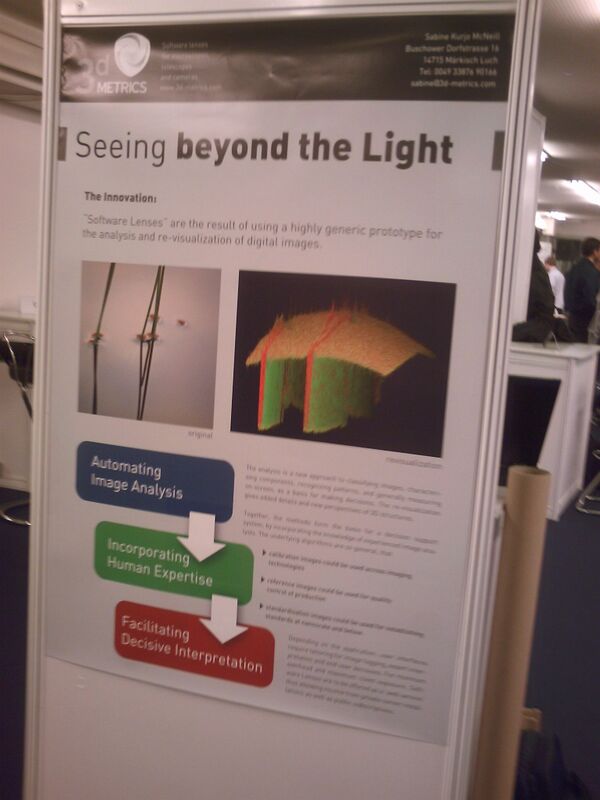 This entry was posted in Events, Exhibition and tagged Brussels, Photonics Europe. Bookmark the permalink. Congratulations on being accepted! Now let’s hope they not only have deep pockets, but also arms long enough to reach the bottom 🙂 ! I guess the most interesting visitor was the consultant who wants to contact a former client to discuss “quality control” with our image analysis. Otherwise, I’m glad I went to see the state of the art and I thoroughly enjoyed the ever present European spirit and atmosphere. I came back via Liege and Duisburg where I spent 5 hours in a warm waiting room, before taking a most comfortable and EMPTY ICE train. So it could have been MUCH worse!